INTRODUCTION: This study was designed and implemented with the purpose of identify and analyze the stakeholders in Iran's Health Insurance System (HInS). MATERIALS AND METHODS: This study was a mixed method study. The study setting was in the field and consists of all organizations in the HInS. The study steps designed according to the Kammi Schmeer stakeholder analysis model. The information was collected through semi-structured and structured interviews with 16 stakeholder representatives. The data collection tool was checklist and matrixes that determined the characteristics of the stakeholders. Analysis of data was done by Maxqda10and Mactor software. RESULTS: A total of 34 stakeholders were identified that were involved in nine main activities of HInS. Major stakeholders have governmental nature. The Government, the Planning and Budget Organization, the Ministry of Health, the Welfare Ministry, the Higher Health Insurance Council, and the Medical Council were stakeholders who have high financial, decision-making, and political power simultaneously. The Parliament and the Health Commission, the Government, the Planning and Budget Organization, and the Ministry of Health were stakeholders that had the most influence on other stakeholders. Most of stakeholders have same position to the objectives of the HInS. The insurer organizations had opposed position with the objective of integrity of the funds. CONCLUSIONS: Stakeholders of Iran's HInS are multiple and involved in various activities that sometimes they are overlapping and parallel. Regarding the same position of the majority of stakeholders to the objectives, reforms are possible, provided that influential stakeholders participate in policies making. The health-care system in Iran is essentially based on the insurance system. This structure has an important impact on the efficiency and effectiveness of providing health care. There are many stakeholders in Iran's Health Insurance System (HInS) that all or part of their activities forms the health insurance. The Iran Health Insurance Organization is established to provide health insurance for government employees, villagers, and other social groups, and is run as a governmental company. The Social Security Organization is as one of the largest insurer organizations of Iran that undertakes supplying health insurance in the formal sector for employed persons who have principal-agent relationship, and at the same time, has a large number of clinics and hospitals property for giving services. The Armed Forces Medical Insurance Organization provides health insurance of military personnel. With the aim of recognition of material deprivations, Imam Khomeini Relief Committee is covered poor individuals of society under its insurance. Among these, also varieties of private insurer organizations, with the aim of using insured persons from health facilities of nongovernmental sector, filling the vacuum services, and obligations of basic health insurance, would form diversity and competing in the field of health insurance activity, and they provide insurance services. There are also a number of semi-public insurer companies, which their policies generally were a cover of copayment for costly hospital services. Policymaking in relation with health insurance in Iran are carried out by the Higher Insurance council and insurer organizations are its executive. All decisions taken in this council for implementation need to be approved by the government. What's clear is that the HInS in Iran consists of several actors who each have a particular task. These tasks have overlap with each other in some organizations or were accomplish something in parallel areas. The multiplicity of organizations and differences of roles has created challenges in Iran's HInS. Studies in this area demonstrated that not being accountable of the current rules, not being transparent of Higher Insurance Council and Ministry of Health role, the multiplicity of organizations and insurance funds, lack of proper communication between insurance organizations and providers, and fragmented structure are serious challenge. Undoubtedly, one of the most important pillars of designing and creating health reforms is the health insurances status, which increases equitably access to health care for people. In each country, to improve the insurance system, different elements should be considered and tried to improve it., One of these elements is stakeholders. In any system, cognition and analysis of stakeholders are basic pillars. For example, in Turkey, to assess the impact of health system reforms, a stakeholder analysis study designed and implemented, or in another study in Afghanistan, the stakeholders involved in the development of the health services package identified and their power level and position determined. Policymakers and managers can, by analyzing stakeholders, identify key actors and explore issues such as knowledge, interests, position, and communication between them., This task allows policymakers to interact more effectively with main stakeholders and have more support on specific policies or programs. Furthermore, reforms in Iran's HInS will not be possible without identification and correct analysis of the role and effects of its actors. For this reason, this study was designed and implemented with the goal of identify and analyze the actors of the HInS of Iran. This study is a mixed method study. The study setting was in field and includes all the organizations and institutions involved in Iran's HInS. The study population were included all managers, experts, and officials of organizations and institutions involved in the HInS. Sampling was done purposefully and 16 informed members in the field of health insurance were interred in study as a sample. In different phases, collecting information method was through semi-structured and structured interviews. The information gathering tool was an interview guide, a stakeholder analysis checklist, and matrixes of influences and position of stakeholders. Interviews analyzed with the content analysis technique and using Maxqda10 software and information of stakeholder characteristics analyzed with Mactor software. The study process was designed and implemented using Kammi Schmeer model that has recommended by the World Health Organization (WHO) in its stakeholder analysis. According to the used model, the study was performed in four general phases. This phase was designed proportionate with both the first stage of Schmeer model “planning the process” and “selecting and defining a policy.” In this phase, workgroup was formed to analysis of stakeholders and during the two sessions of the program of doing the work, specified the objectives of analysis, how to apply the results and its users. To understand the nature of the subject under consideration, that is, HInS of Iran, all the relevant documents and articles in this field were reviewed. Accordance with the third step of the Schmeer model, this phase was identified “key stakeholders in HInS.” For identification of stakeholders, in addition to reviewing relevant documents and evidences, institutional mapping technique was used. Based on this, the stakeholders are identified based on the activities that involved in it. Hence, semi-structured interviews were conducted on 16 persons of experts in the insurance field who were selected purposefully. In these, interviews were questioned about the current activities in Iran's HInS, inside and outside actors involved in each activity, the role of any stakeholder, and possible stakeholder coalitions. This phase was accomplished the fourth, fifth, and sixth steps of the Schmeer model, namely, “adapting the tools,” “gathering information,” and “filling in the stakeholder table.” In adapting the tools, a checklist was designed which consisting of the role of each stakeholder in each activity and sources of stakeholder power in five aspects of financial power, decision-making, political, legal, and insurance technical knowledge. With the determination of influential stakeholders, was designed the stakeholder influences matrix and stakeholders were compared to each other in terms of influence on each other. Matrix of position was also formed to identify the position of the stakeholders in relation to the objectives in the HInS. By analyzing the textual content of the WHO reports of 2000, 2010, and 2013,,, which were the most relevant documents in this area, eight objectives were considered for the HInS. Then, in position matrix, the stakeholders are placed in the row and the objectives in the column and position of each stakeholder is valued between 0 and 4 toward objectives. These three designed tools were completed by 16 members of insurance filed experts who were purposefully selected from involved organizations in the HInS. 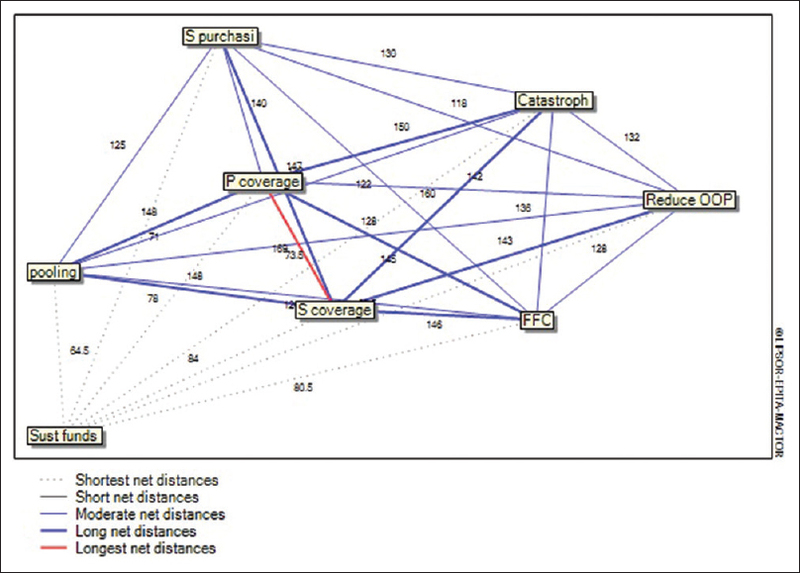 This phase was considered the last two stages of the Schmeer model, that is, “stakeholder analysis” and “use of information.” Accordingly, the findings in the results of interviews were analyzed by content analysis method and Maxqda10 software and information resulted from checklists and matrixes with Mactor software. The results were categorized in six sections. The first section shows the stakeholders, their activities, and areas of activity; in the second section, the power of stakeholders has been investigated; in the third section, influences and dependencies between actors shown; in the fourth section, relationship between actors and objectives shown; in the fifth section, convergences between actors and in the sixth section, convergences between objectives shown. By analyzing the content of interviews, main activities and actions in the HInS of Iran in nine themes were classified such as financing, services purchasing, population coverage, tariff setting, payment systems, audit of bills, monitoring and evaluation, supportive activities, and incidental damages. Based on these activities and using the institutional mapping technique, the involved stakeholders were identified in each activity. In total, 34 actors were involved in identified activities. The Ministry of Health, Higher Insurance Council, Ministry of Welfare, Iran Health Insurance Organization, Armed Forces Medical Insurance Organization, Health Insurance of Imam Khomeini Relief Foundation, Social Security organization, and Welfare Organization were actors who have played a full role in the nine activities. Most actors were involved in four activities of financing, population coverage, services purchasing, and payment systems. The major activities of actors were active at the national level. Most of the actors have activity as governmental organizations. 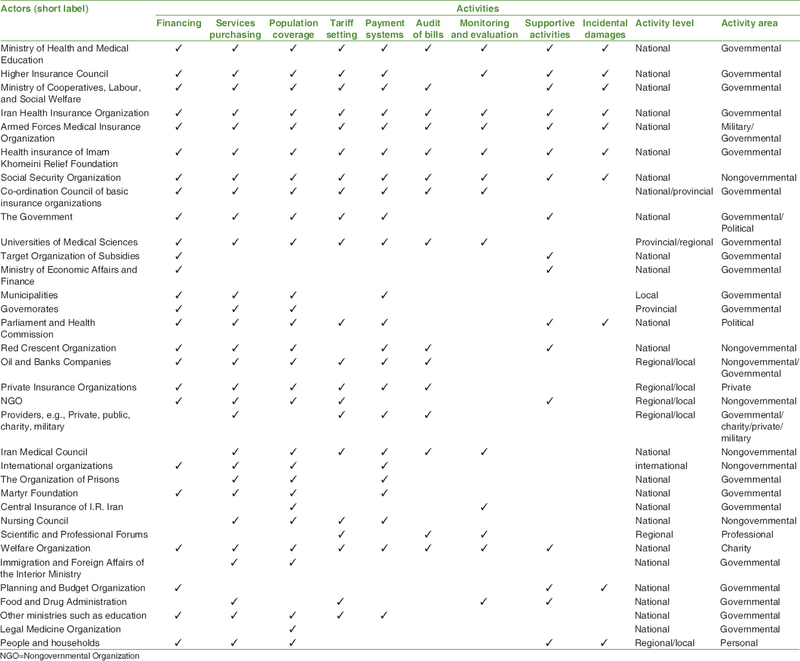 [Table 1] shows the activities relevant to each stakeholder, the level of activity, and the area or activity sector. [Table 2] shows the status of stakeholder's power source. 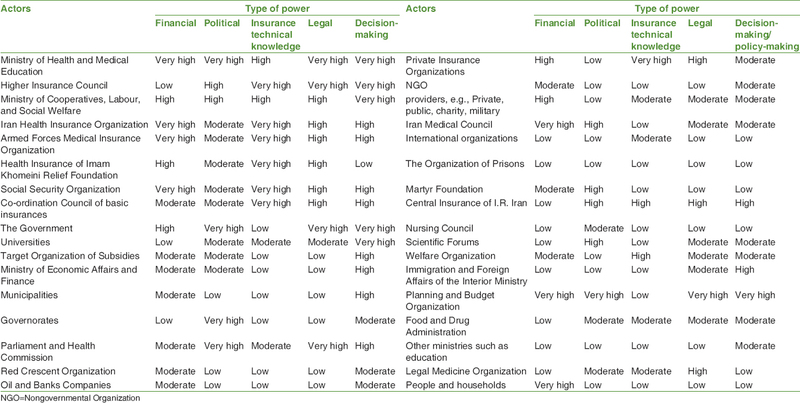 Stakeholders who have very high power at same time in aspects of financial power, decision-making power, and political power in the HInS of Iran, were included the Government, the Planning and Budget Organization, Ministry of Health, the Ministry of Welfare, Higher Health Insurance Council, and the Medical Council. According to this map [Figure 1], parliament and the health commission, the government, the Planning and Budget Organization and the Ministry of Health, respectively, were identified as the most influential actors in HInS of Iran and recognized as leaders of the insurance system (northwest quarter of the map). These actors were recognized as the most competitive actors in Iran's HInS, which have the most influences on the other actors. Providers of health services, were introduced as the most dependence actors. Other dependence stakeholders are observable in the Southeast quarter of the map that has high dependences and relatively low influences. Furthermore, other actors (actors located in the Southwest quarter of the map), had low influence and dependence and they were not counted very as determinative actors a lot. By textual content analysis of reports in 2000, 2010, and 2013 of the WHO, which was the main document in this area; the main objectives of the HInS were classified into eight themes. These objectives include: (1) reduce out of pocket (short label: Reduce OOP), (2) reduce catastrophic health expenditure (short label: Catastrophic), (3) universal population coverage (short label:P coverage), (4) comprehensive coverage of health services (short label: S coverage), (5) the integrity and sustainability of the funds (short label: Sust funds), (6) strategic purchasing (short label: S purchasi), (7) risk and resources pooling through fair prepayments (short label: pooling), and (8) Increases Fair Financial Contribution (short label: FFC). After determining the objectives, the relationship and position of actors were examined toward each of the objectives. The results showed that almost all actors had a positive position toward objectives of number 1, 2, 3, 4, 6, 7, and 8 and they knew that these objectives are vital for success in their operating procedures, projects, missions, and its existence. Only in the objective number 5, five actors, which were main basic insurer organizations in Iran (Iran HInS, Social Sec, Relief Fou, Armed Insu, and Welfare Or) had a negative position toward this objective. 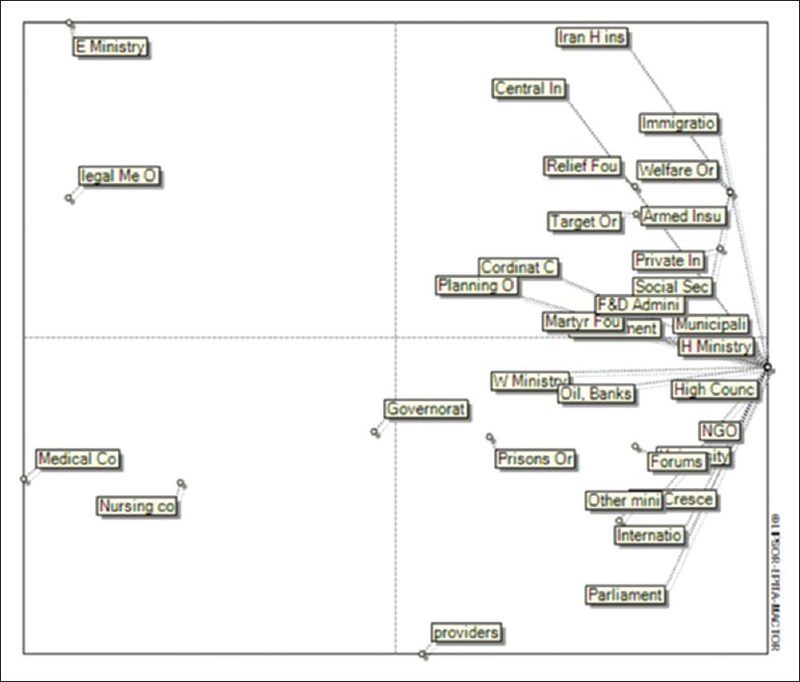 The map of convergences between actors maps the actors with respect to their convergences on objective. This would identify the number of possible alliances. As the convergence map [Figure 2] has shown, insurer organizations such as the Iran Health Insurance Organization, the Armed Forces Medical Insurance Organization, the Health Insurance of Imam Khomeini Relief Foundation, the Social Security Organization, the Welfare Organization, the private insurance organizations, Iran Central Insurance and Target Organization of Subsidies were in one range, and hence there is a convergence between these stakeholders that showed their common position on common objectives. There is another convergence between stakeholders such as the Ministry of Health, the Ministry of Welfare, the government, the parliament, the Higher Health Insurance Council, the Co-ordination Council, the Medical Sciences Universities, the Planning and Budget Organization, the Martyr Foundation, and the Immigration and Foreign Affairs of the Interior Ministry. Service providers, the Medical Council, the Nursing Council, the Ministry of Economic Affairs and Finance, the governorates, and legal medicine are part of stakeholders who have weak convergence with other stakeholders and are more independent. 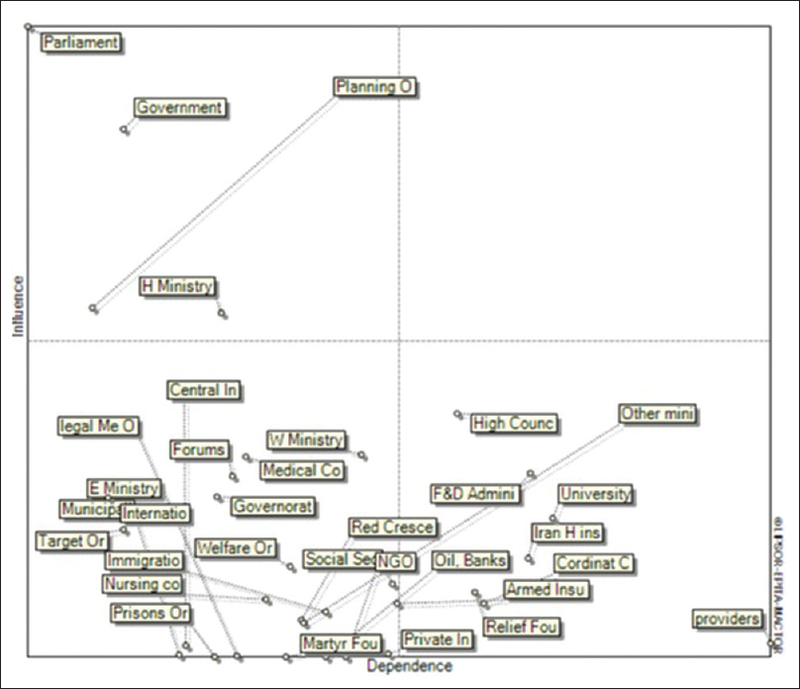 This graph is used to identify objectives on which actors take the same position (either pro or against). The stronger the link between objectives, the higher the convergence of actors' opinions on these objectives. According to this graph [Figure 3], the objective of “universal population coverage” has very high convergence with the objective of “service coverage” (the red line), it is meaning that the stakeholders have extremely identical position to these two objectives. The only objective that has very weak convergence with other is integrity of insurance funds (dashed line). The results of this study showed that many actors in Iran's HInS are involved in various roles and activities. According to the characteristics of the Iran health system, which uses a public cooperative model and a set of different methods for financing and providing health services, there are numerous actors with different roles that it can be justified. However, what matters are accurate recognition of features and role of these stakeholders in the activities and processes of insurance system that cause to be avoided a lot of parallel work and possible overlapping. The results showed that in Iran HInS, a major stakeholder have governmental nature and activate at the national level, and sometimes in regional and local. According to article 44 of the Iran constitution, insurance is one of the sections, that is, as public domain and at disposal of the government. The results of this study show complete consistent with this law in Iran. Four basic insurer organizations (Iran HInS, Armed Insu, Relief Fou, and Social Sec) in addition to welfare organization and private insurances are actors who all their activities forms health insurance. These actors have high financial and decision-making power. The multiplicity of these funds and independent management of each one have created ruptures in Iran HInS. The WHO knows creation of multiple insurance funds of the rupture indicators in organizing funds. These actors have negative position toward the purpose of integration in financial funds and believed that with integrity in the funds are endangered their operating procedures. On the other hand, also difference in the source of accumulated financial resources in these funds is not without effect in this position. In the same field, both Moghadasi and Raisi studies have said biggest challenges in the Iran HInS is multiplicity of organizations and insurance funds., It seems that the physical integrity of these funds is not feasible at present and the only way to intervene in this area is to integrate management of these funds with the focus of an independent actor. Also in Sedighi study, they considered integration and solidarity in health insurance structure and the organizing of its various components as a necessity, which can prevent appearing of overlaps, inconsistencies, and wasting resources. Government, the Planning and Budget Organization and Parliament also were actors that have very high legal, financial and political power. These three actors have an important role in financing and resource allocation in HInS. Since health insurance in Iran, due to its governmental nature, is most often rely on government from the point of financial resources, they highly felt the need to constructive interaction with these three actors. The results showed that these three actors with the Ministry of Health are most influential actors in Iran's HInS. These four stakeholders had enormous influence on operating procedures, projects, missions, and the existence of other organizations. In a study in Afghanistan which has analyzed the stakeholders package of health service, the Ministry of Finance had most power of influences and the Ministry of Health and the people had low power. Usually, in each system that follows the features of free market, its actors have different position (pros and cons) to the available objectives of this system. The results of this study showed that in HInS that there was the phenomenon of market failure in it, almost all stakeholders with available objectives in it has same and congruent position. Among these objectives, the major positions of actors were on three objectives of service coverage, population coverage, and reduce expenditures. These objectives have high convergence in HInS, which indicates the majority of actors have same position on these objectives. These objectives were the main components of universal health coverage, and this suggests that an intention and national will was created to achieve on it occurred in Iran. Stakeholders of Iran's HInS are multiple and involved in various activities that sometimes they are overlapping and parallel with each other. Since the majority stakeholders were the governmental nature, the power was in hand of the Government, the Parliament, the Planning and Budget Organization, and the Ministry of Health. Regarding the same and agreement position of the majority of stakeholders with regard to the objectives of the insurance system, it is possible to implement reforms in this system if influential and powerful stakeholders participate in policies making. Since this study focuses solely on the Iran HInS stakeholders and their characteristic, what that has not been addressed in previous studies, distinguishes it from other studies. For this reason, the results of this study can be useful in the future reforms. This study was part of a PhD thesis at the Iran University of Medical Sciences. The authors sincerely appreciate all the efforts of individuals who helped us in any way for this study. This study was financially supported by the Iran University of Medical Sciences (grant no. IUMS/SHMIS_9221557204). Davari M, Haycox A, Walley T. The Iranian health insurance system; past experiences, present challenges and future strategies. Iran J Public Health 2012;41:1-9. Najar AV, Karimi I, Sadaghiani E. The process of information system in service packs of complementary health insurance in selected countries and presenting a model for Iran. Health Inf Manag 2006;3:51-62. Mehrdad R. Health system in Iran. JMAJ 2009;52:69-73. Jahangir M. Provision and Regulations of Social Security and Welfare. Tehran: Dowran Publication; 2006. Moghadasi H, Hosseini AS, Asadi F, Ismaili M. The problems of Iran health insurance system and the necessity of reform approach. Health Manag 2011;14:71-9. Raeisi AR, Mohammadi E, Noohi M. The points of improvement and solutions to improve the quantity and quality of Iran's health insurance, qualitative study. Health Inf Manag 2013;10:1-8. Rezaee A, Dabbagh A. Different patterns to optimize health insurance system. Razi 2008;11:73-81. Bahadori M, Ravangard R, Alimohammadzadeh K, Hosseini SM. Plan and road map for health reform in Iran. BMJ 2015;351:h4407. Akinci F, Mollahaliloğlu S, Gürsöz H, Oğücü F. Assessment of the Turkish health care system reforms: A stakeholder analysis. Health Policy 2012;107:21-30. Haidari AM, Zaidi S, Gul R. Prospects for the sustainability of delivering the basic package of health services in Afghanistan: A stakeholder analysis. East Mediterr Health J 2014;20:300-8. Gilson L, Erasmus E, Borghi J, Macha J, Kamuzora P, Mtei G, et al. Using stakeholder analysis to support moves towards universal coverage: Lessons from the SHIELD project. Health Policy Plan 2012;27 Suppl 1:i64-76. Saghafi F, Abbasi K, Keshtgari E. Sustainable value creation framework on stakeholder management (case study: Native operating system of Iran). Modiriat E Farda J 2014;13:20-42. Abiiro GA, McIntyre D. Universal financial protection through national health insurance: A stakeholder analysis of the proposed one-time premium payment policy in Ghana. Health Policy Plan 2013;28:263-78. Schmeer K. Stakeholder analysis guidelines. Policy Toolkit for Strengthening Health Sector Reform. WHO int. 2000;2:1-43. World Health Organization. World Health Report: Health Systems Financing: The Path to Universal Coverage (Arabic). Geneva: World Health Organization; 2010. World Health Organization. Research for Universal Health Coverage. Geneva: World Health Organization; 2013. Zare H. Privatization Strategies of Health Insurance: Principles, Basis of Health Status of Iran. Iran: Medical Services Insurance Organization; 2006. Dehnavieh R. Design Model of Basis Health Insurance Package for Iran. Iran: Iran University of Medical Sciences; 2007. Sedighi S, Hesam S, Maleki M. Influencing factors on the establishment of basic health insurance in Iran. Healthc Manag 2013;4:7-19. Tynkkynen LK, Keskimäki I, Lehto J. Purchaser-provider splits in health care-the case of Finland. Health Policy 2013;111:221-5. Mättö T. Implementation of Quality Cost Management Tool in Dyadic Purchaser-Provider Relationship Context. Jyväskylä Studies in Business and Economics 114; 2012. Gallego R. Introducing purchaser/provider separation in the Catalan health administration: A budget analysis. Public Adm 2000;78:423-42. Siverbo S. The purchaser-provider split in principle and practice: Experiences from Sweden. Financ Account Manage 2004;20:401-20. Zare H. Available Challenges to do Integrate Health Insurance in Iran. Iran: Majlis Research Center; 2007.